The Florida Young NOW is committed to empowering and involving young feminists, encouraging an intergenerational voice, and strengthening ties and collaboration between activists of all ages. Our goal is to amplify the representation, chapter development, and input of young activists. We seek to also elevate state-coordinated collaboration and interaction between adult chapters and millennial chapters, while strengthening peer mentorship and relationships in the Florida NOW community. 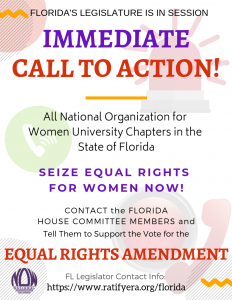 The Florida Young NOW heavily prides itself in the mission to fight for equal representation, equal respect, equal consideration, and equal pay for all. We not only strive for equality, but for social justice, safety, liberty, stability, and positive change for all people. We aim to create this equality by building a strong and united intersectional approach in our campaigns as we fight against discrimination, racism, sexism, ableism, sexual violence, domestic violence, sexual trafficking, and other inequalities faced by communities all over the world. In doing so, we celebrate and embrace our differences as well as lift up the voices of marginalized communities so that we can better understand their narratives and fight against injustices. The Florida Young NOW members actively strive to engage in their communities by petitioning their city councils, volunteering at their local domestic-violence shelters, registering voters for elections, organizing activist events against/for important legislation matters, and planning meetings where people of different communities can share their experiences. We are a newly organized, youth-centered state committee approved by the Florida NOW State Council. The Florida Young NOW includes chapter and Campus Action Networks from throughout the state. We invite feminist members of all backgrounds to engage in our community activism. It is a good idea to select the issues and national action campaigns that your chapter will work on early in the semester. Here are a list of the NOW issues and campaigns.